DZSWS:1983.6138 1 photograph of an aquatint of an artist's view of Stonehenge entitled "Grand Conventional Festival of the Britons". The picture shows a view of a "complete" Stonehenge stone circle, the inner ring of stones covered with cloth banners, with crowds of people taking part in ceremonies, processionals and animal sacrifice. Crowds are ranged in and around the stones and in procession towards the stones. Large numbers are sitting around the stones on an encopassing circle of tiered seating cut into the landscape. People can be seen carrying spears, swords, shields, staffs and banners. Most are dressed (some in costume, some not), some appear to be naked. Two pairs of oxen can be seen dragging boat-shaped objects bearing large chests/coffers within the procession of peopletowards the entrance. There are a number of people on horseback. 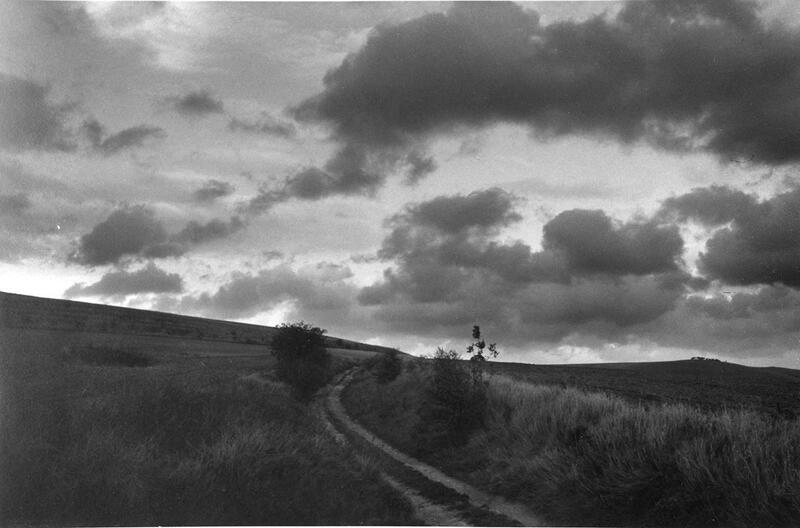 DZSWS:1983.7005 Photograph, print and negative, lynchets to the west of Kitchen Barrow Hill, Bishops Cannings, Wiltshire, 1966. DZSWS:1983.7009 Photograph, engraving of drawing by John Britton of reconstruction of Avebury stone circles, Avebury, Wiltshire. DZSWS:1983.7010 Black and white photograph of Knapp Hill, Alton, Wiltshire, possibly 1983. DZSWS:1983.7012 Photograph, Devils Den, Preshute, made into a Christmas card, Preshute, Wiltshire, 1911=1923. DZSWS:1983.7013 Photograph, with man in bowler hat at Devils Den, Preshute, Wiltshire, 1911=1923. DZSWS:1983.7014 Photograph, Devils Den, Preshute, Wiltshire, circa 1890. DZSWS:1983.7017 Photograph, Manton Long Barrow, Preshute, Wiltshire, date unknown. DZSWS:1983.7018 Photograph, aerial view of mortuary enclosure, Dorchester-on-Thames, Oxfordshire, 1940=1960(?). DZSWS:1983.7019 2 photographs, of the west end of the cursus near Stonehenge, Amesbury, Wiltshire, November 1965. DZSWS:1983.7020 Photograph, print and negative, long barrow Horton Down, Bishops Cannings, Wiltshire, 1966. DZSWS:1983.7021 Photograph, aerial view of causewayed camp at Whitesheet Down, Kilmington, Wiltshire, 1969. DZSWS:1983.7022 Photograph, aerial view of a henge monument, Marden, Wiltshire, 1950=1970(?). DZSWS:1983.7024 Photograph, recumbant sarsen boulders on Fyfield Down, Fyfield, Wiltshire, 1950=1970(?). DZSWS:1983.7025 Photograph, aerial view of West Kennet Long Barrow and area to the south, Avebury, Wiltshire, 1946(?). DZSWS:1983.7026 Photograph, 24 negatives of Avebury and surrounding area, Avebury, Wiltshire, circa 1920. DZSWS:1983.7027 Photograph, replica of the Donneruplan Ard, a prototypical form of plough, found in Scandanavia(?). DZSWS:1983.7028 Photograph, view of West Kennet Avenue, Avebury, Wiltshire, 1940=1960(?). DZSWS:1983.7029 Photograph, Stonehenge, with visitors looking at stones within circle, Amesbury, Wiltshire 1945=1956. DZSWS:1983.7030 Photograph, in colour, of Stonehenge at sunset, Amesbury, Wiltshire, 1979. DZSWS:1983.7032 Photograph, showing the destruction of barrow, Goddard 3, Bishops Cannings, Wiltshire, 1959. DZSWS:1983.7034 Photograph, showing a cast flanged bronze axe in Salisbury Museum, Salisbury, Wiltshire. DZSWS:1983.7035 Photograph, close-up of stones, Stonehenge, Amesbury, Wiltshire, 1959. DZSWS:1983.7036 Photograph, pottery impression of naked barley from Windmill Hill, Avebury, Wiltshire. DZSWS:1983.7037 Photograph, barrows at Milton Lilbourne excavated by Mr P Ashbee probably in 1958, Milton Lilbourne, Wiltshire. DZSWS:1983.7038 Photograph, of Stonehenge with two men, Amesbury, Wiltshire, 1874. DZSWS:1983.7039 Photographs, 12 negatives showing grave groups published in Inventaria Archaeologia. DZSWS:1983.7040 Photographs, showing enlargements of objects in Devizes Museum (including a dagger, an axe blade and gold pins), Devizes, Wiltshire. DZSWS:1983.7049 Photograph, of North Down barrow group, Bishops Cannings, Wiltshire, 1969. DZSWS:1983.7050 Photograph, of an engraving, View of Stonehenge From The East by James Basire, from Colt Hoare's Ancient Wiltshire, early C19th, Amesbury, Wiltshire. DZSWS:1983.7051 Photograph, showing dagger carvings, Stonehenge, Amesbury, Wiltshire, 1968. DZSWS:1983.7052 Photograph, showing dagger carvings, Stonehenge, Amesbury, Wiltshire, 1968. DZSWS:1983.7053 Photograph, showing dagger carvings at Stonehenge, Amesbury, Wiltshire, 1968. DZSWS:1983.7054 Photograph, of the watercolour in Devizes museum, by Copley Fielding of Stonehenge, Amesbury, Wiltshire. DZSWS:1983.7055 Photograph, of Stonehenge with group of men, Stonehenge, Amesbury, Wiltshire, circa 1900. DZSWS:1983.7056 Photograph, of Stonehenge with a group of men, Stonehenge, Amesbury, Wiltshire, circa 1900. DZSWS:1983.7057 Photograph, part of pavement, Roman Villa, Box, Wiltshire. DZSWS:1983.7058 Photograph, of pavement from Roman villa during re-excavation of the floor, Castle Copse, Bedwyn Brail, Great Bedwyn, Wiltshire, 1936. 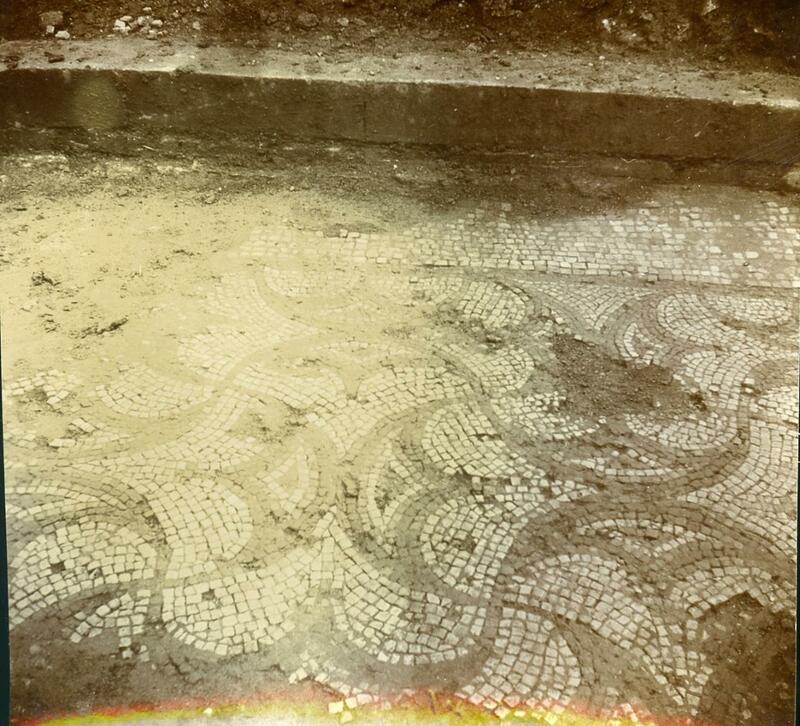 DZSWS:1983.7059 Photograph, of pavement from Roman villa during the re-excavation of the floor, Castle Copse, Bedwyn Brail, Great Bedwyn, Wiltshire, 1936. DZSWS:1983.7060 Photograph, view of Barbury Castle, bivallate hillfort, Wroughton, Wiltshire, 1950=1960(?). DZSWS:1983.7061 Photograph, aerial view of iron age hill fort, Chisbury Camp, Little Bedwyn, Wiltshire, 1960=1980(?). DZSWS:1983.7062 Photograph, aerial view of rectangular enclosure at Denny Sutton Hipend, Pewsey, Wiltshire, 1972. DZSWS:1983.7063 Photograph, aerial view, 1967. DZSWS:1983.7064 Photograph, aerial view, 1967. DZSWS:1983.7065 Photograph, of the barrow, Whetham, Calne, Wiltshire. DZSWS:1983.7066 Photograph, of north side of Battlesbury Camp, showing iron age pits (A/B), Warminster, Wiltshire, 1956. DZSWS:1983.7067 Photograph, of north side of Battlesbury Camp, showing iron age pits (A/B), Warminster, Wiltshire, 1956. DZSWS:1983.7068 Photograph, looking east from Hindon cross roads, Hindon, Wiltshire, 1959. DZSWS:1983.7070 Photograph, of All Cannings Cross, iron age settlement, All Cannings, Wiltshire, 1989. DZSWS:1983.7071 Photograph, of the river Kennett at Lockeridge, Wiltshire, 1960. 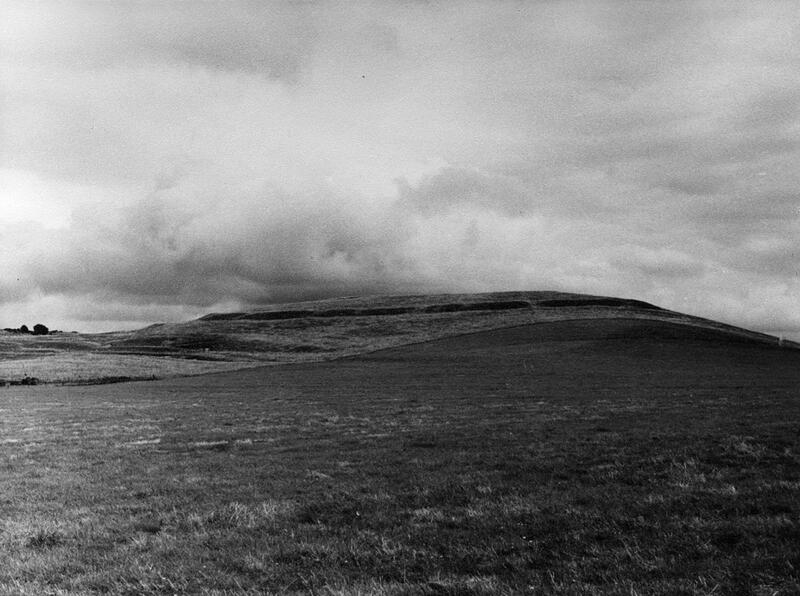 DZSWS:1983.7072 Photograph, view from Walkers Hill, Alton Barnes, Wiltshire, 1959. 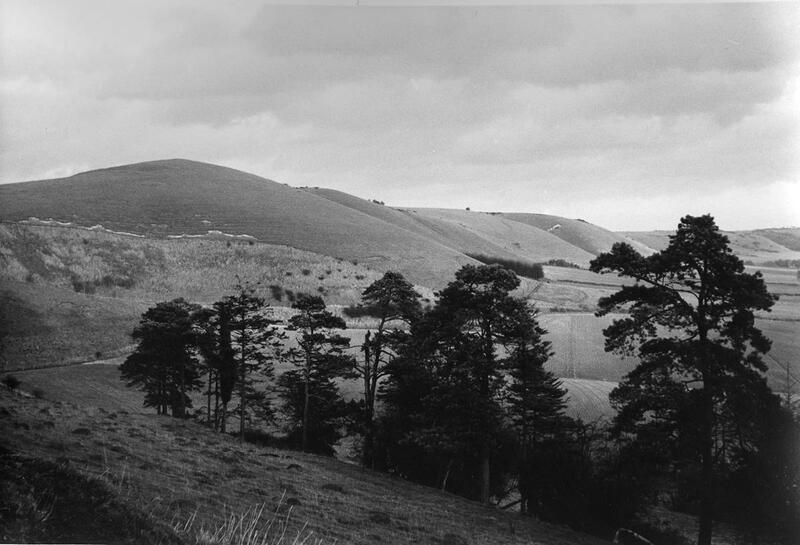 DZSWS:1983.7073 Photograph, view from Walkers Hill, Alton Barnes, Wiltshire, 1959. DZSWS:1983.7074 Photograph, man with bowler hat leaning on fence near standing stone, Avebury, Wiltshire. DZSWS:1983.7075 Photograph, view of bank and ditch with group of people, Avebury, Wiltshire. DZSWS:1983.7076 Photograph, young man sitting by standing stone, Avebury, Wiltshire. DZSWS:1983.7077 Photograph, young man by standing stones and farm buildings, Avebury, Wiltshire. DZSWS:1983.7078 Photograph, view of bank and ditch, with derelict cottage, Avebury, Wiltshire. DZSWS:1983.7079 Photograph, view towards village with standing stones, Avebury, Wiltshire. DZSWS:1983.7080 Photograph, bank and ditch with sheep, looking towards village, Avebury, part of a set sold by C W Clarke of Devizes, Avebury, Wiltshire, 1860=1900. DZSWS:1983.7081 Photograph, two ladies by standing stone, Avebury stone circle, Avebury, Wiltshire. DZSWS:1983.7082 Photograph, man in bowler hat by standing stone, Avebury stone circle, Avebury, Wiltshire. DZSWS:1983.7083 Photograph, view of Avebury stone circle looking towards village, Avebury, Wiltshire. DZSWS:1983.7084 Photograph, standing stone, Avebury stone circle,. DZSWS:1983.7085 Photograph, Avebury stone circle,. DZSWS:1983.7086 Photograph, man by standing stone near group of trees, Avebury stone circle, Avebury, Wiltshire. DZSWS:1983.7087 Photograph, men by standing stones near hayrick and cottages, Avebury stone circle, Avebury, Wiltshire. DZSWS:1983.7088 Photograph, cattle grazing amongst stones, Avebury stone circle, Avebury, Wiltshire. DZSWS:1983.7089 Photograph, avenue of trees in Autumn with man, Avebury, Wiltshire. DZSWS:1983.7090 Photograph, Avebury stone circle, two ladies in the distance, Avebury, Wiltshire. DZSWS:1983.7091 Photograph, Avebury village showing Red Lion Inn, with carriage drawn by two horses, Avebury, Wiltshire. DZSWS:1983.7092 Photograph, Avebury stone circle, excavations in progress, probably those of St George Gray, Avebury, Wiltshire. DZSWS:1983.7093 Photograph, raising fallen stone at Avebury stone circle, traction engine visible, Avebury, Wiltshire, 1912. DZSWS:1983.7094 Photograph, raising fallen stone at Avebury stone circle, traction engine visible, Avebury, Wiltshire, 1912. DZSWS:1983.7095 Photograph, postcard(?) showing the raising of a fallen stone at Avebury stone circle, traction engine visible, Avebury, Wiltshire, 1912. DZSWS:1983.7096 Photograph, Avebury stone circle and surrounding area, Avebury, Wiltshire, 1920. DZSWS:1983.7097 Photograph, Avebury stone circle and surrounding area, Avebury, Wiltshire, 1920. DZSWS:1983.7098 Photograph, Avebury stone circle and surrounding area, Avebury, Wiltshire, 1920. DZSWS:1983.7099 Photograph, Avebury stone circle and surrounding area, Avebury, Wiltshire, 1920. DZSWS:1983.7100 Photograph, Avebury stone circle and surrounding area, Avebury, Wiltshire, 1920. DZSWS:1983.7101 Photograph, Avebury stone circle and surrounding area, Avebury, Wiltshire, 1920. DZSWS:1983.7102 Photograph, Avebury stone circle and surrounding area, Avebury, Wiltshire, 1920. DZSWS:1983.7103 Photograph, Avebury and surrounding area, Avebury, Wiltshire, circa 1920. DZSWS:1983.7104 Photograph, Avebury and surrounding area, Avebury, Wiltshire, circa 1920. DZSWS:1983.7105 Photograph, Avebury and surrounding area, Avebury, Wiltshire, circa 1920. DZSWS:1983.7106 Photograph, Avebury and surrounding area, Avebury, Wiltshire, circa 1920. DZSWS:1983.7107 Photograph, Avebury and surrounding area, Avebury, Wiltshire, circa 1920. DZSWS:1983.7108 Photograph, Avebury and surrounding area, Avebury, Wiltshire, circa 1920. DZSWS:1983.7109 Photograph, Avebury and surrounding area, Avebury, Wiltshire, circa 1920. DZSWS:1983.7110 Photograph, Avebury and surrounding area, Avebury, Wiltshire, circa 1920. DZSWS:1983.7111 Photograph, Avebury and surrounding area, Avebury, Wiltshire, circa 1920. DZSWS:1983.7112 Photograph, Avebury and surrounding area, Avebury, Wiltshire, circa 1920. DZSWS:1983.7113 Photograph, Avebury and surrounding area, Avebury, Wiltshire, circa 1920. DZSWS:1983.7114 Photograph, Avebury and surrounding area, Avebury, Wiltshire, circa 1920. DZSWS:1983.7115 Photograph, Avebury and surrounding area, Avebury, Wiltshire, circa 1920. DZSWS:1983.7116 Photograph, Avebury and surrounding area, Avebury, Wiltshire, circa 1920. DZSWS:1983.7117 Photograph, Avebury and surrounding area, Avebury, Wiltshire, circa 1920. DZSWS:1983.7118 Photograph, Avebury and surrounding area, Avrbury, Wiltshire, circa 1920. DZSWS:1983.7119 Photograph, replica of the Donneruplan Ard, a prototypical form of plough, found in Scandanavia(?). DZSWS:1983.7120 Photograph, part of Stonehenge, Amesbury, Wiltshire, 1945=1956. DZSWS:1983.7121 Photograph, in colour, of Stonehenge, Amesbury, Wiltshire 1979.